In many cases, I like to center a main element of a wallpaper’s design on the wall. 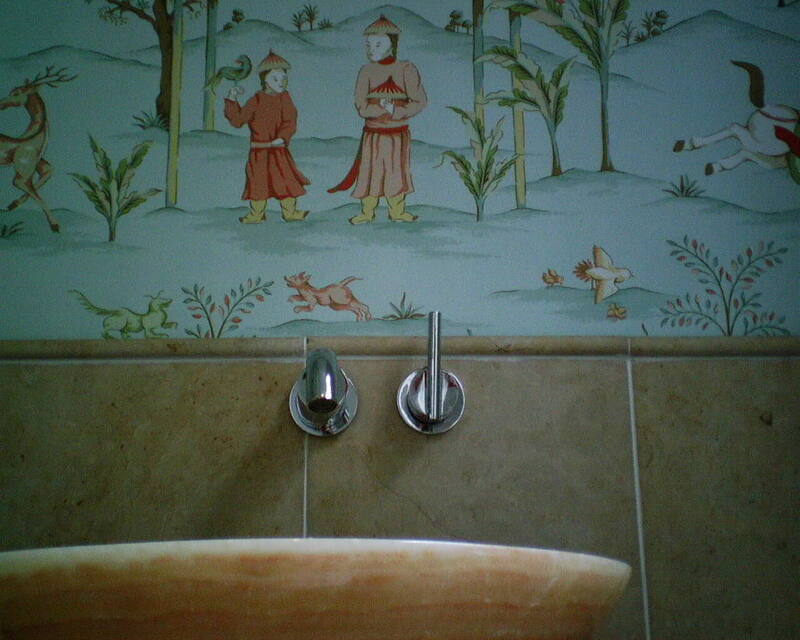 But it becomes complicated when, as in this powder room, the sink and faucet are a little off-center, the light fixture is not centered on the wall nor above the sink, and the main motif in the wallpaper is off-kilter, too…. The two Chinese men are not standing exactly in the middle of the pavilion. So what to do? Do I place the pavilion in the middle of the wall, or do I center it over the sink, or do I center it under the light fixture? Do I center the pavilion on the wall, or the two men? I decided to place the pavilion so its center lined up with the faucet. (Which, BTW, is on the left – the gizmo on the right is the handle.) But when I had the first strip up on the wall, it didn’t look right. It turned out that the two men were not centered under the pavilion. And since they are boldly colored and dominant, the whole thing looked off-balance. So I pulled that strip off the wall, repasted it to keep it workable, and repositioned it on the wall so that the cloaks of the two men flanked the mid-point above the faucet. It’s one of those things you can’t put your finger on. But you know that something is pleasing about how it looks when you face the sink and mirror. This entry was posted on May 24, 2015 at 7:04 am and is filed under Uncategorized. You can follow any responses to this entry through the RSS 2.0 feed. You can leave a response, or trackback from your own site.